This is as gruesome as we are going to get in the Lost World project. Grisly enough, I think. We have shot most of the material, but still have a lot of post processing to do. You might wonder just how we create an image like this. We are eight people in the project, and no one can draw worth a damn (unless they are keeping it a secret). 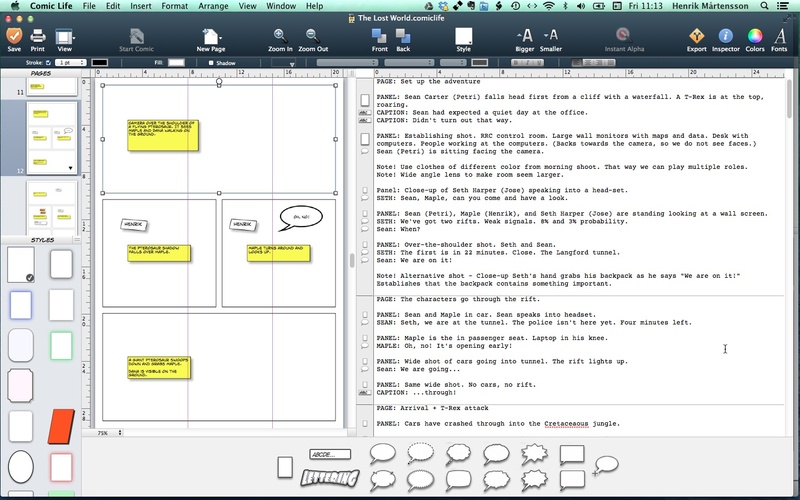 The process started in Comic Life 3, where I wrote a first draft of the script, and made a dummy layout with empty panels. This makes it easy for the entire team to see what we are working on, and how it fits with the bits we have done, and all the stuff we haven't done yet. 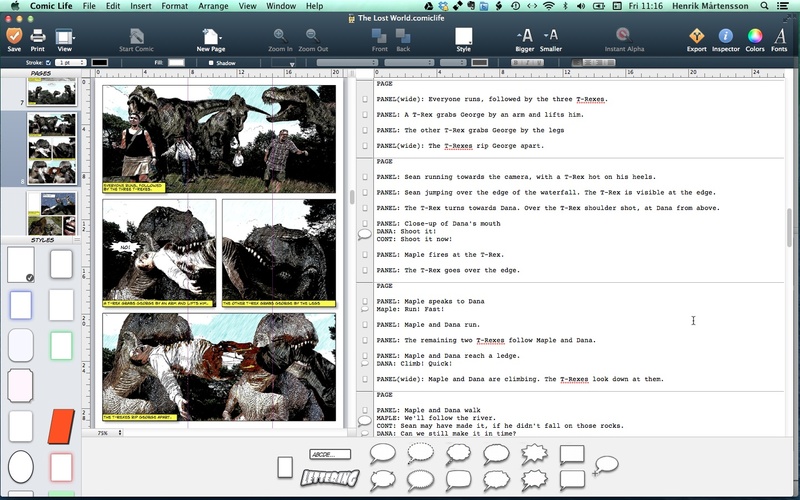 The script and dummy layout is also a great help when the team discusses story ideas and improvements. We always have a printed copy of the dummy layout when we are out shooting. When we have done a shoot, we add photos to key panels as quickly as possible. This helps us track what we have done. It also gives us a sense of the look and feel of the whole thing. 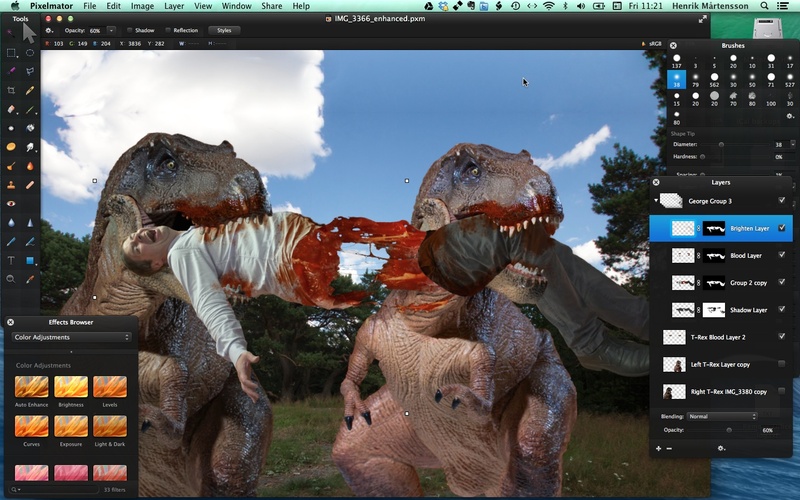 We do most of the compositing in Pixelmator. As you can see, the composites are not photo realistic. They are not supposed to be either, since this is just an intermediary stage, before we import the photos into Comic Life 3 and apply the final drawing conversion there. Working this way is a great timesaver. Photorealism takes time. Using a comic book style allows us to work much faster, and still create very exciting and interesting images. 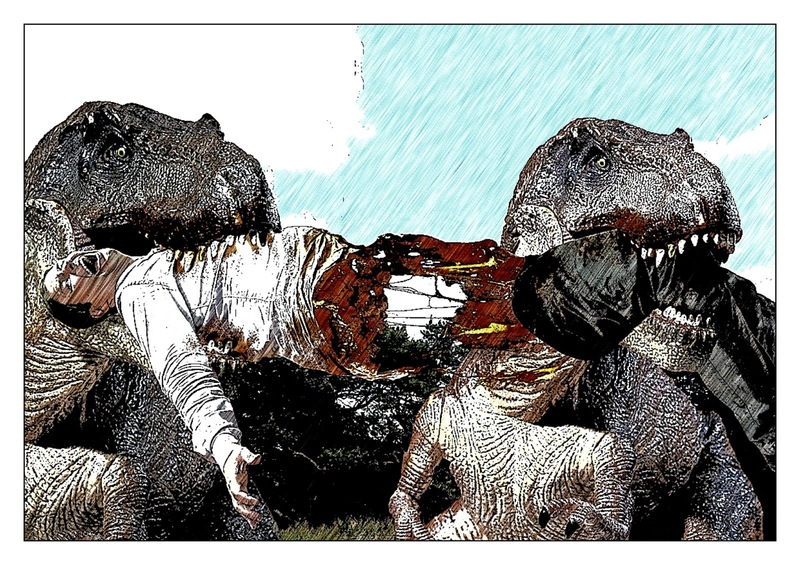 Also, when we get to the goriest parts, like this photo of George and the T-Rexes, turning the photo into a drawing reduces the emotional impact a bit. We want to tell an exciting action story, not revel in blood and gore.